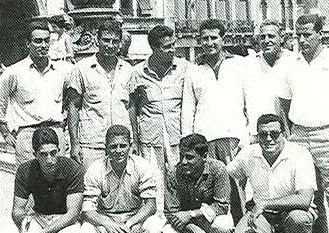 The team of SNC Civitavecchia, 5th in the B' Division of the 1960 Italian Championship. Standing L-R: Leocini, Zingaropoli, Palomba I, Palomba II, Di Gennaro (coach), Stella Saul. Seating L-R: Pateri, Milo, Saladini, Gargiullo.